Exactly 100 years to the day when Cardinal James Gibbons dedicated St. Elizabeth Home as an orphanage for African-American children in Baltimore, former orphans were among those returning to the building Sept. 17 for a special Mass celebrating a century of diverse ministry at the site. Opened by the Franciscan Sisters of Baltimore in 1917, the orphanage at 3725 Ellerslie Avenue later operated as a school for children with special needs and a residential high school. Over the course of its long history, the building also served as the Franciscan Sisters of Baltimore’s motherhouse, novitiate and infirmary for elderly sisters. 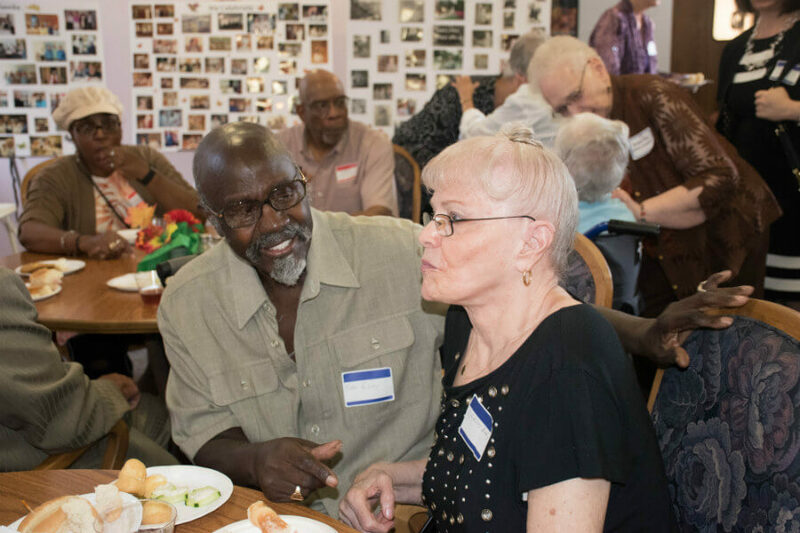 Throughout the century, the Franciscan Sisters of Baltimore – a religious community that merged with the Wisconsin-based Sisters of St. Francis of Assisi in 2001 – have had a continual presence at the site. Dorothy Dorsey recalled first coming to the orphanage when she was a toddler. Instead of walking down the steps to the first floor, she said, she slid down a chute. Dorsey, along with two sisters – Sarah Gamble and Maria Royster – fondly recounted how the Knights of Columbus brought them gifts, goodies and entertainment for every holiday. Gilbert Richardson, another former resident of St. Elizabeth Home, recalled rooming with other boys on the third floor. The girls boarded on the second floor, the nursery was on the fourth floor and the first floor served as a common space for dining and schooling. When Richardson was 12, he moved to a farm where a family raised many of the older boys from St. Elizabeth and taught them farming. John and Shirley Billy recalled how in the 1950s, their baby was taken from them at the hospital right after he was born without them knowing about it. It was then against Maryland law for the Billys to be together – John is an African-American man, and Shirley is a white woman. Officials placed the boy in the nursery at St. Elizabeth Home while the Billys mounted a legal struggle that lasted two years before they finally were able to get him back. While the Billys’ son was at St. Elizabeth Home, his parents remembered how the sisters allowed them to visit, play, take pictures and go outside. The couple wrote a book, “FLAVOR,” which stands for Faith, Love and Victory over Racism. The Franciscan Sisters of Baltimore have their roots in England. Five sisters from the Franciscan Sisters of Mill Hill in London came to Baltimore in 1916 with the mission of helping the African-American community. St. Elizabeth Home provided a living space for approximately 300 children, with the sisters providing an education. The home closed in 1960, due to desegregation and a decreasing number of orphans. The sisters renovated the first floor of the building and opened St. Elizabeth School in September 1961. Regina Coeli Academy, a residential high school for girls, operated from 1962 to 1968 in a wing of the building. A new building was built for St. Elizabeth School on another part of the property in 1967, but classrooms and offices remained on the first floor of the main building until 1996. In 1982, in the motherhouse building, the sisters began Chestnut Hill Activity Center for graduates of St. Elizabeth School. The program became part of Catholic Charities’ Gallagher Services a few years later. In 2003, after the merger with the Sisters of St. Francis of Assisi, the first floor of the building was renovated to provide supportive living for elder sisters. The remaining two thirds of the building is now occupied by Homes for America, a non-profit housing developer. On the upper floors, Homes for America created 30 affordable apartments for individuals and families. Present at the anniversary celebration was Deborah Reddy, who first came to St. Elizabeth Home when she was four. 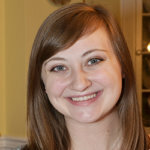 At five, she was placed into a foster home and remained in foster homes until she was an adult. In 2005, Reddy returned to live in the same building, this time with her ten-year-old granddaughter, in the Homes for America apartments. Her granddaughter moved out when she graduated, but Reddy continues to live in the apartment. Reddy has now worked for the sisters as a nurse for about ten years. She said that coming back to the building was like coming back home. Sister of St. Francis of Assisi Cecilia Reilly, a former superior general of the Franciscan Sisters of Baltimore, noted that the outside of building had not changed at all since she first arrived in the 1950s. She currently lives at a retreat center in Manchester with two other sisters. “It’s really exciting to see the different groups that were here,” Sister Cecilia said. Father Martin Burnham celebrated the 1 p.m. Mass along with Sulpician Father Robert Leavitt, former president-rector of St. Mary’s Seminary in Roland Park. In his homily, Father Leavitt recounted two stories: one of a Franciscan sister kneeling before a homeless man and helping him two find shoes; the other, of sisters helping a wealthy boy with special needs learn to tie his own shoes. 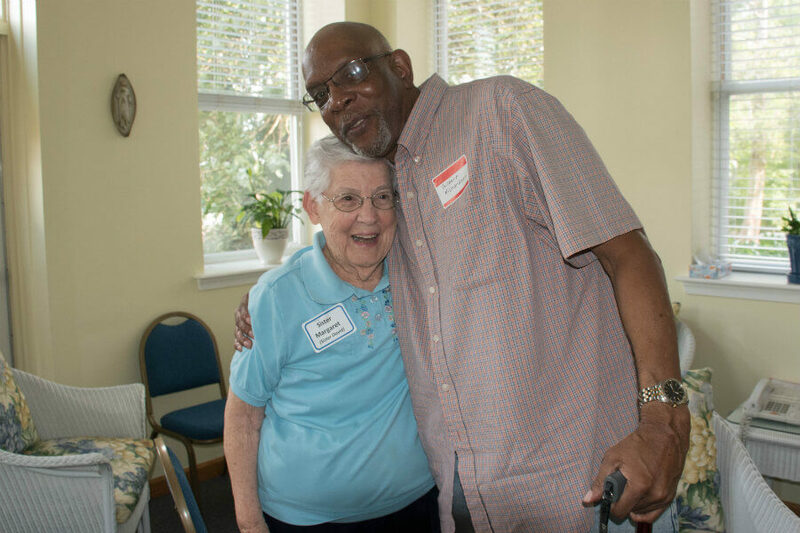 Such stories exemplify the generous, caring and hospitable nature of the Franciscan Sisters of Baltimore, he said, who were founded under the name of a shoeless saint.